Collective Arts Brewing, a brewery that fuses the craft of brewing with the inspired talents of artists and musicians, is launching in Florida on November 10, 2018, partnering with Cavalier Distributing for distribution for the entire state Ten members of the team will be traveling throughout the state, kicking off their Florida expansion with a week’s worth of events featuring art installations, live music, and tap takeovers. They’ll be launching with a range of core beers including Life in the Clouds IPA, Stranger than Fiction Porter, Jam Up the Mash Dry Hopped Sour and a selection of rotating small batch brews. 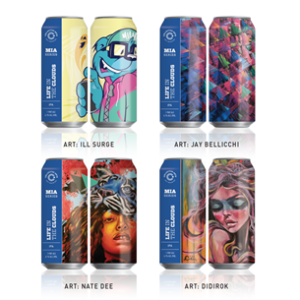 Collective Arts Brewing has partnered with four Miami-based artists to produce limited-edition beer cans as a way to celebrate their official launch. Collective Arts’ beer will be available year-round in retail stores including Whole Foods and Total Wine, and bars and restaurants throughout Miami, Orlando, Tampa, St. Petersburg, and Jacksonville. 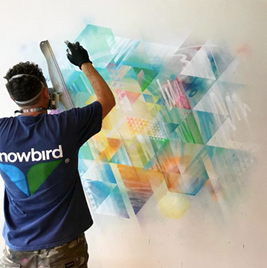 SURGE, born in Los Angeles and raised in Miami, is a Postgraffisim artist, and has taken his bold, unmistakable style straight from his sketchbooks to the sun-stained streets of South Florida and beyond. Surge has worked with Brands like NIKE, Jameson Whiskey, the NBA, the Miami Dolphins, Microsoft, and Bloomingdales to name a few. It is the ability to be daring and free with his art that is ultimately closest to Surge’s heart. 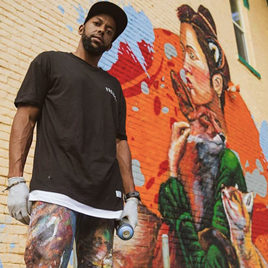 Born and raised in South Florida, Nathan Delinois (Nate Dee) has numerous influences including his Haitian background and the use of color Haitian art, as well as in street art. The design quality of the Art Nouveau movement and the drama of Greek art from the Hellenistic. These elements can be seen in his work. Additionally, he takes some influences from the pop surrealists. Diana Contreras (b. Peru, 1981) has established herself as an influential Miami artist. 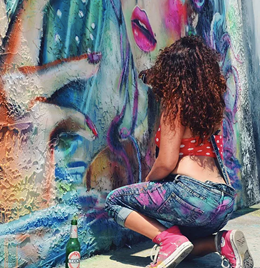 From painting murals in the Urban Art scene to exhibiting canvas pieces in galleries, her work has been seen in exhibitions and private collections in several parts of the world including Street Art Dubai Gallery in Dubai. Jay Bellicchi (REMOTE) a Boston transplant, has taken his place in the Miami art scene as a dynamic artist influenced by his history in graffiti and graphic design. His father was a successful artist and graphic designer who inspired him at a young age. In the 1980’s Jay was further influenced by hip-hop music and the elements surrounding it. 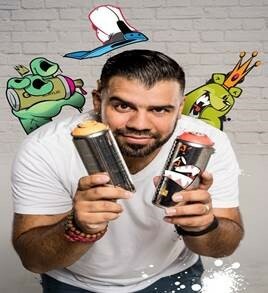 It was within the hip-hop culture that he discovered the element of graffiti art and was given the name by which he is still known today, REMOTE. Collective Arts Brewing, founded in 2013 in Hamilton, Ontario, is committed to fusing the craft of brewing with the inspired talents of emerging artists. Their beers are designed to be as diverse, creative, and unwavering as the artists profiled; respecting tradition, but not constrained by it. Collective Arts features limited-edition works of art by artists and musicians that change every few months. To date, more than 650 artists and musicians have been featured and championed by Collective Arts.